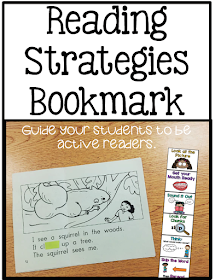 Last week I mentioned the use of reading strategies. 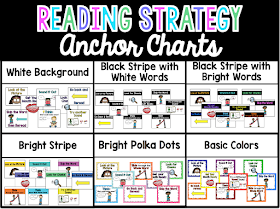 Teaching these strategies and giving kids the opportunities to practice/apply these strategies is my biggest focus during guided reading at the beginning of the year. I introduce these decoding strategies one by one. I model the strategy during read aloud, shared reading and guided reading groups. 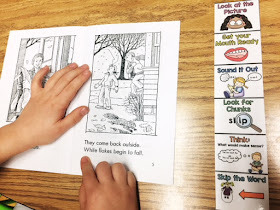 I use "think-alouds" to model while I'm reading to the class. 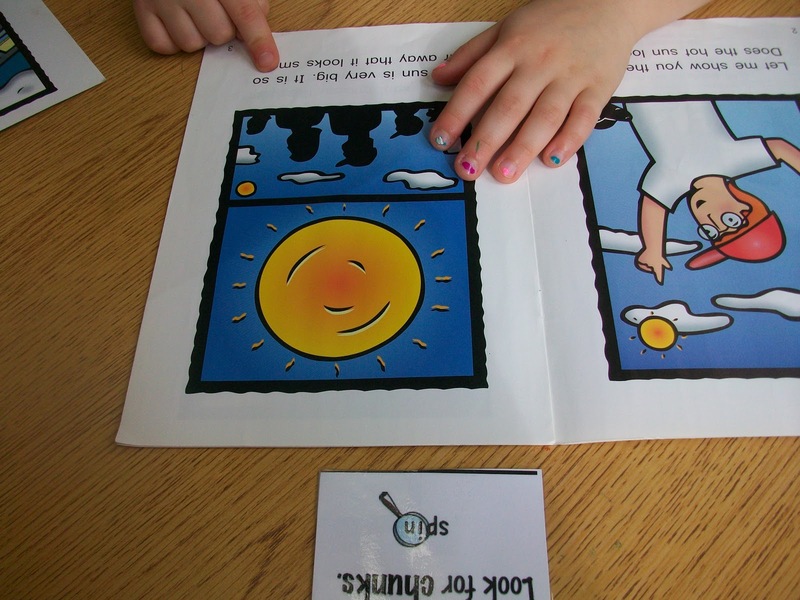 During guided reading groups, I introduce the strategy. I show students a visual of that strategy and model how to use it. 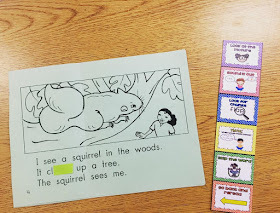 We practice together using parts from our book or using sentences that I make up. Sometimes I'll enlarge a page from a book to model a strategy. Here, I'm showing them how to skip and go back. I would model by reading the sentence and skipping the highlighted word that I don't know. I "think aloud" the whole time. I go back and reread the sentence and discuss what would make sense with that first letter. Here, I would model how I would chunk the words in the first row. Then I would model reading a sentence and chunking one of the words. For guided practice, we would do the next few together. Even your "higher" ability kids need to work on chunking. I would just make the words harder, but it's the same skill! For the picture below, I was modeling the strategies look at the picture and get your mouth ready. These are both strategies that I introduce right away. Both of these strategies can be taught with much simpler texts. When I first introduced these strategies, I literally had a picture with one or two words. I reviewed this strategy later on as the texts were getting harder, but the picture clues could still help. 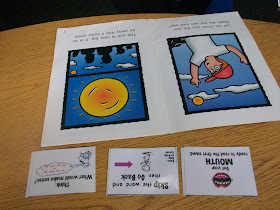 For this page, students can look at the picture and the first letter of the word head to figure it out. They would also need to think about what made sense to figure it out. That's why I love reviewing these earlier strategies once we've learned other strategies! Right before they read their books, I always remind them of what their "strategy focus" is. "Remember that today while you are reading, you will be working on using __________ strategy." While they are all reading, I will check in with a student and listen to them read. They are all "whisper reading" at this point. This is my opportunity to assess a student's ability to use this strategy and to guide my students to apply the strategy correctly. Some groups may catch on quicker than others so you may want to spend more time focusing on a strategy with certain groups. 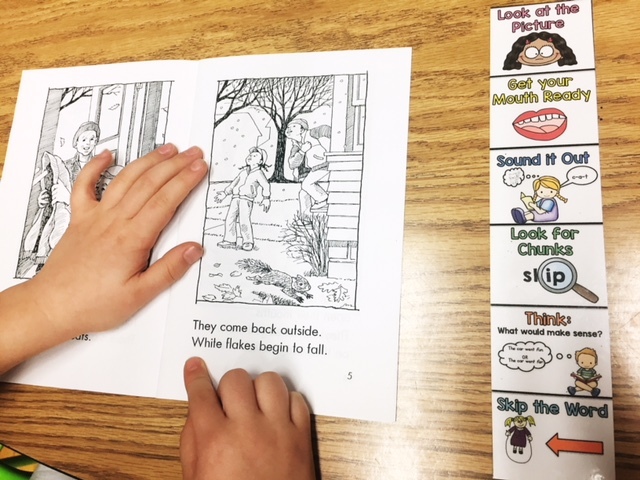 At the end of guided reading, I always point out to the group all of the good things I saw when I read with each of them. I'll give examples of how each student used a strategy to figure out a word. For example, "I saw Bobby skipped the word "does" and then went back and reread. After he got his mouth ready, he figured it out. At this point in the year, we've already introduced all of the strategies. 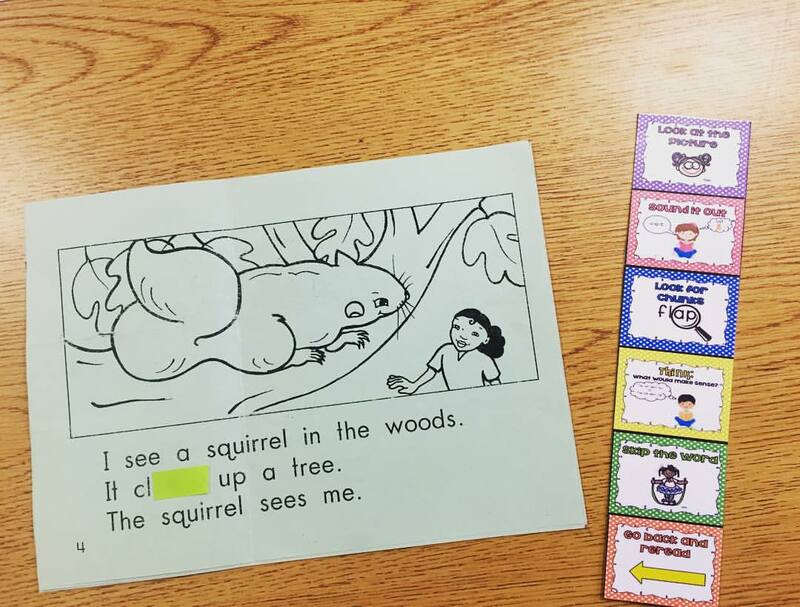 Even though students have learned all the strategies, they still need to practice applying them in a guided setting. With some groups, I may have a particular strategy that we will be focusing on together. With other groups, I may give each student a particular strategy that they need to work on. Above is a picture of a mini sized strategy card right above my student's book. She is chunking that last word on the page. At this point in the year, we've been practicing this particular strategy for a while, but this is her strategy focus. Before she can ask for help, she has to try this strategy. In this picture, there are three strategy cards because this student is working on using these three strategies together. 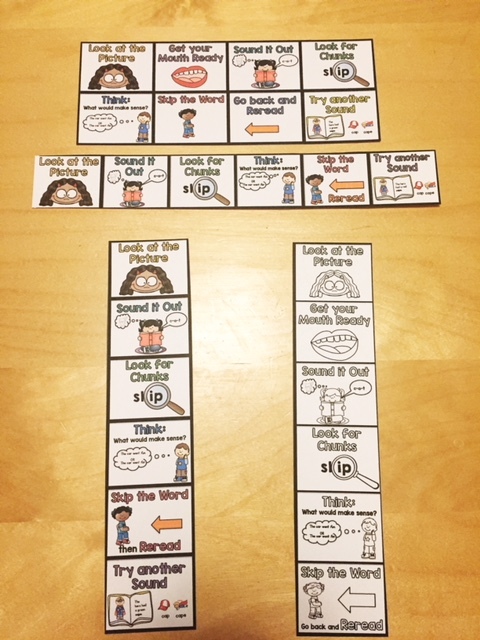 This student relies mainly on phonics so she often uses the strategies "sound it out" and "look for chunks". As you know, this doesn't really help her when she gets to sight words that aren't phonetic. So she is focusing on skipping the word, going back and rereading. The other two strategies are think about what makes sense and get your mouth ready (make the first sounds in the word). I have her use those strategies together. Here's an example: Sam does not have fun. The word does is not a phonetic. So, she skips it, reads the rest of the sentence, goes back and rereads the sentence. When she gets to the word does, she "gets her mouth ready" by just saying the first sound, /d/. When she reads Sam /d/ not have fun, she will more than likely (if she thinks about what makes sense) be able to figure out the word does. 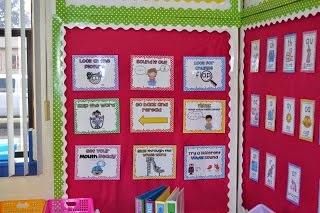 I have my reading strategy posters hung in my classroom next to my Guided Reading area. However... how often do they really look up while they are reading? So, I shrunk the cards to make little mini strategy cards that they could use while reading. You could do the same with any strategy posters that you use. 1. To remind them of their strategy focus. 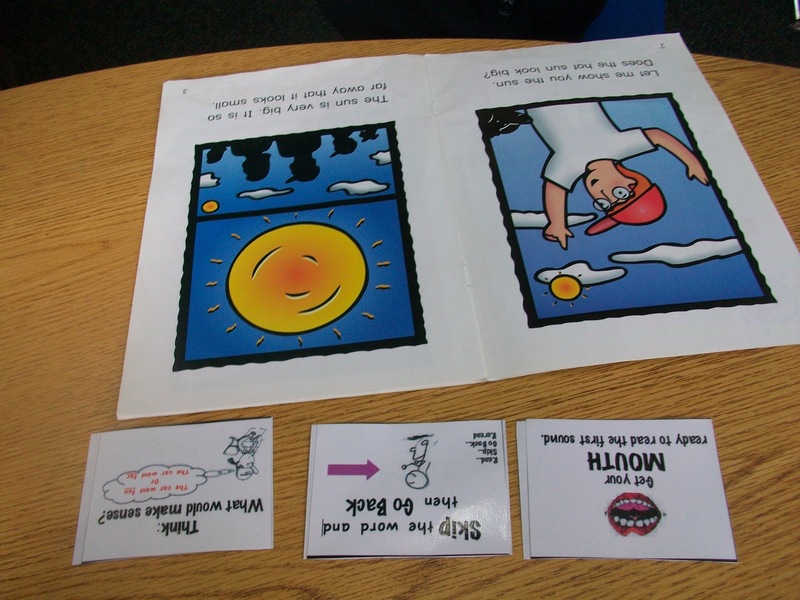 Give your students these mini-cards while they are "whisper reading". You can give them just one focus card or several cards. 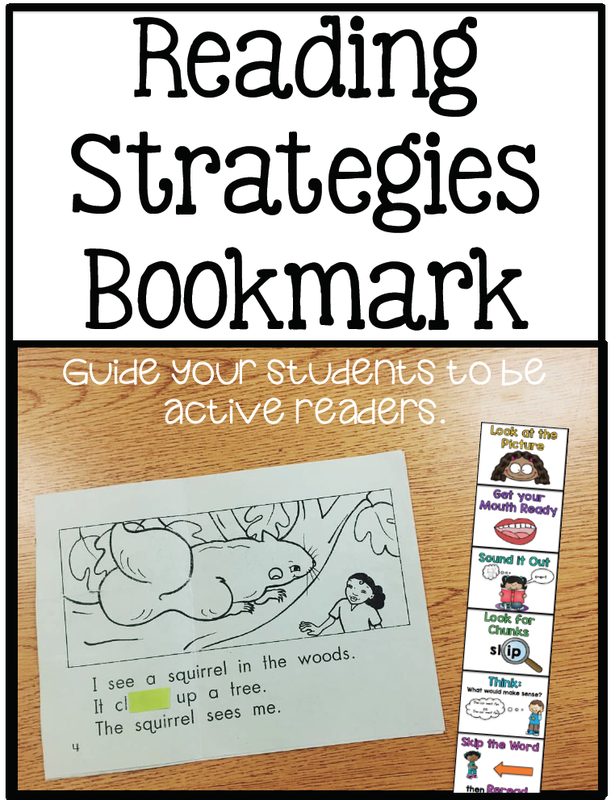 If you want them to be reminded of all the strategies, give them a bookmark with all the mini-strategy cards. 2. It's also fun to have all the cards out and have them tap the card when they used a particular strategy. 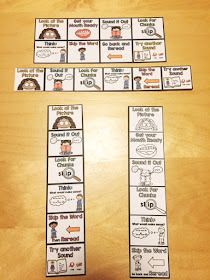 If you really need to motivate your kiddos to use strategies, you could keep track of how often they tap a card with math counters to put on the strategy cards. They also really like to just put a little dot on their card with a dry erase marker. 3. A fun game to play with the strategy cards is Guess My Strategy. I will read from a book or write a sentence on the board or sentence strip. I underline the word that I need to figure out. When I get to that word, I call on kids to tell me which strategy I should use to figure out the word. You could also have them all hold up the strategy card to show what they think. That gets them all involved. I show my students this page and ask them how they think I figured out the highlighted word. They explain why they think I chose that strategy. There are so many great resources available for you out there, but I made these to share with you too. 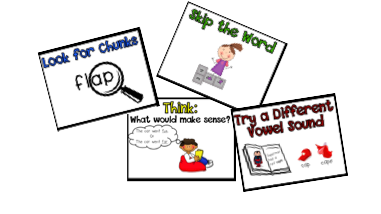 In the free download, I included bigger posters of the strategies and the smaller versions for each student to use in your guided reading groups. You could cut them up individually and you could also laminate the two sides back to back to make a bookmark for kids. I included vertical and horizontal options. You can get these strategy cards by clicking here. Sarah, your blog is truly darling! You have a wonderful thing on here! So glad I stopped by! I LOVE these, but was wondering if you have a blank template that if we wanted to we could create other cards based on maybe a different strategy the kids needed (I just want to keep the theme the same!). Thanks so much - these are great! Hi, Just wondering if you can change the pink one from stretching the word to - say it slowly? In the big and little size? 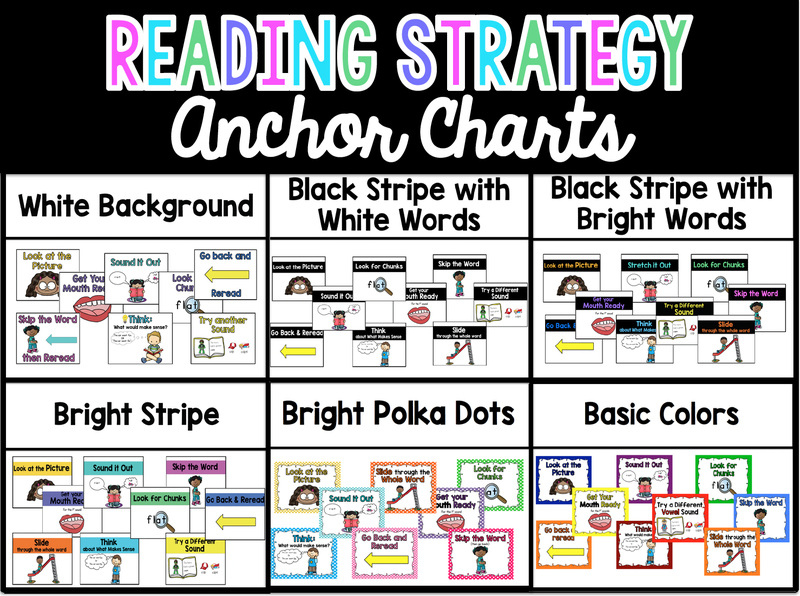 Great article here with excellent strategies to help young readers and those who are challenged with reading. Thank you for posting this for all of us! Thank you again for a great article AND for all the help you provide to teachers and parents through your good blog here! This is awesome, thank you!!!! Just what my students need! Thanks so much!!! Can you tell me the order you teach these strategies in? Is there an order? Thank you so much! I love the strategy bookmarks. I was trying to make a checklist for kids to use to monitor what strategies they are using. Can I ask where you go the clipart. I would like to use the same pictures on my checklist to keep it consistent. Any chance you can switch the one bookmark to say "Stretch it out" to match the big poster?! Please!! I love your strategy cards!